The Australian Road Safety Foundation (ARSF), Deputy Prime Minister Michael McCormack and New South Wales Police joined forces today alongside a victim of road trauma in an effort to reduce Christmas tragedy. New South Wales recorded a horror festive season on the roads last year with 34 lives claimed in the state over the short period. It was the most affected state, with New South Wales crashes making up more than two thirds of the nation’s total toll (91). In an effort to reduce tragic loss of life throughout the festive season, road authorities called on the nation’s drivers to take caution through a powerful road safety reminder. 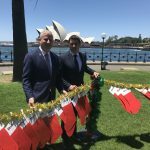 91 stockings were hung in memoriam of the lives tragically cut short on Australian roads during the 2017/18 festive period, the youngest being just seven years old. Young father Aaron McDonald also shared his story, as he prepares to spend this Christmas at the hospital bedside of his young daughter while she fights for her life following a recent crash. With the 2018 road toll at 1050, there are countless more families around the country sadly facing their first Christmas without their mother, father, brother, sister, son or daughter this year. Acting as a solemn reminder for all those using the road this festive season, ARSF founder and CEO Russell White said the 91 Christmas stockings would hopefully encourage Australians to do everything in their power to save lives. “It’s heartbreaking to think that for 91 more families, the holiday season will now forever be marred by the memory of losing someone precious to them,” he said. NSW Police Assistant Commissioner Michael Corboy said the state’s drivers really needed to overcome the ‘it won’t happen to me’ mentality and instead drive to survive. “If today’s installation stops just one driver, pedestrian or cyclist from taking a risk, and prevents just one fatal or serious crash, it is worth it,” he said.